VERITY LAMBERT has, so they say, a glamour job. She is a television producer. She has been a TV producer for 10 years. since she was 27, and is now working on the last few episodes of a London Weekend Television programme called "Budgie" (tonight at 9 pm). "Budgie" stars Adam Faith, as a petty crook who is always losing, and connoisseurs of such light entertainment reckon the series to be pretty good. "It brings genuine humour and pleasure to the screen." one said. It has certainly brought Miss Lambert to the top—into the successful bracket. which can, she Says, be a bit of a setback. "The more successful you are in this field, the more difficult it is to accept work ...you can't just accept anything, you have to watch your reputation." Such is the price... . However, as it has taken Miss Lambert a few years I to get to this exalted position, no doubt the drawbacks can be stomached. After Roedean (which she denounces in the currently fashionable way —"there were hidden benefits which I don't like to admit to myself") and a spell of the Sorbonne, she took one and a half years to complete a three-month something-to-fall, back-on secretarial course. Her first job, in 1956, was working as a secretary in Granada Television's press office. "I was hopeless, and lazy, and practised yoga in the office." Which all led to the sack six months later because "there wasn't enough work to do. I'm not at all embarrassed about being fired. It was a good thing." She hated the press office; it was just a job. "I hadn't seen television at all until I was 17. so when I took the job, I wasn't particularly interested in television, but gradually I realised it was an interesting thing to do. So when I left Granada I deliberately took a step backwards and went to ABC Television as a shorthand-typist. It was only a means to an end, as I had my sights firmly set on becoming a production assistant." (Note for the layman: Television is full of these grand titles. A PA is at worst another name for a secretary, and at best a fairly responsible position.) Miss Lambert achieved her ambition within a' short time. She became PA to Ted "Kotcheff, ABC's drama director. "Marvellous," she breathes, sweeping her cats off tile table for the umpteenth time, "Marvellous. He demanded total commitment to the job, and I became totally involved." In 1961 she took a break from ABC and went to America: "I wanted to get away for various reasons. And when I returned to ABC I wanted to direct. I had by then been in television for six or seven years; and had been exposed to many aspects of the work, and really felt that I could direct. But it was a bad time; the scene was a bit anti-feminist; and it didn't work out. I got very depressed. I was bored with being a PA and wanted to try something new. I gave myself a year, and thought if a break didn't come in that time, I would get out." It came. In a predictable, it-is-all-a-question-of-who-you-know way. One of her bosses, Sydney Newman (ABC's head of drama) switched to the BBC. He knew her ambitions only too well —she'd nagged him weekly for some time for a directing job—and suggested, she applied for the job of producer of "Dr Who." "Newman had dreamed up the whole idea. It was fantastic. In those days it had everything. Dr Who was a madman, not the Establishment figure he is nowadays, getting on the 'phone to the Prime Minister every five minutes." She got the job on six months' trial, and in the end produced the series for two years. The role of a television producer has always been something of a mystery to me, in much the same way as the non-musical are never quite certain of the conductor's function. Miss Lambert put me right. So far as a series is concerned (as opposed to a one-off play), the producer's role is that of coordinator. That said, the details of the job vary with the assignment. For "Dr Who," it meant starting from scratch, deciding on •the format of the series; corn, missioning scripts, appointing directors, and actors, too, and getting them to work together, after " reasoned discussions," towards a common end. Because any production is a team effort, it is difficult to divide the credits accurately. if a series is a success, all involved are winners. "But undoubtedly the most important part is the script If that isn't right you can forget it." After "Dr Who" came "The Newcomers," a twice weekly series about the problems of a family in a new	town, and then "Adam Adamant." "A marvellous idea about a man who has been frozen in a block of ice, and when he comes back into the world he looks at modern mores through old fashioned eyes. But it just didn't work. I somehow couldn't get it together, couldn't realise it. It was a failure in my terms, but not that bad." Next stop, "Detective." in which she produced a dramatisation of 13 existing detective stories, and from there to Somerset Maugham, and the dramatisation of 26 short stories. "I enjoyed this more than anything I have done. At first, I had to read all his stories. and I got very depressed because he seems to dislike women so much. But in the end I selected 26. They were very easy to dramatise, and so we got terrific scripts." Follow 'that with good directors and a star-studded cast and it all added up to the. Society of Film and Television Arts award for the best drama series of 1969. Up against such competition as "Callan," it can't be bad. After that, she was offered the Production of "Take Three Girls," but she didn't think it was her scene and turned it down. There was nothing else going at the BBC at the time, so she quit and went to LWT and "Budgie?' "I'm glad I did, it is a most stimulating change. Keith Waterhouse and Willis Hall are just great. Adam Faith is a good actor, and the series is a good, original idea." As the series draws to a close. this successful lady, with her beautiful Kensington home, her omnipresent , cats, and floppy-pawed Great Dane pup, is about to move on to single plays. "It is a much more difficult field. There is such a wide choice of plays and writers available. It is easy enough to pick an established writer to do a play; you can't go wrong. The really challenging thing to do is to pick a play by an unknown writer, and then have it turn out to be a great success. If I want to do something, I have to do it well. I suppose this is. in part, my competitive spirit, but really it is because I need to be stimulated out of my laziness." APA 6th ed. : Christmas, Linda (1972-06-23). Verity Lambert, who has produced such television successes as 'Dr Who' and 'Budgie,' talks to Linda Christmas. The Guardian p. 11. MLA 7th ed. : Christmas, Linda. 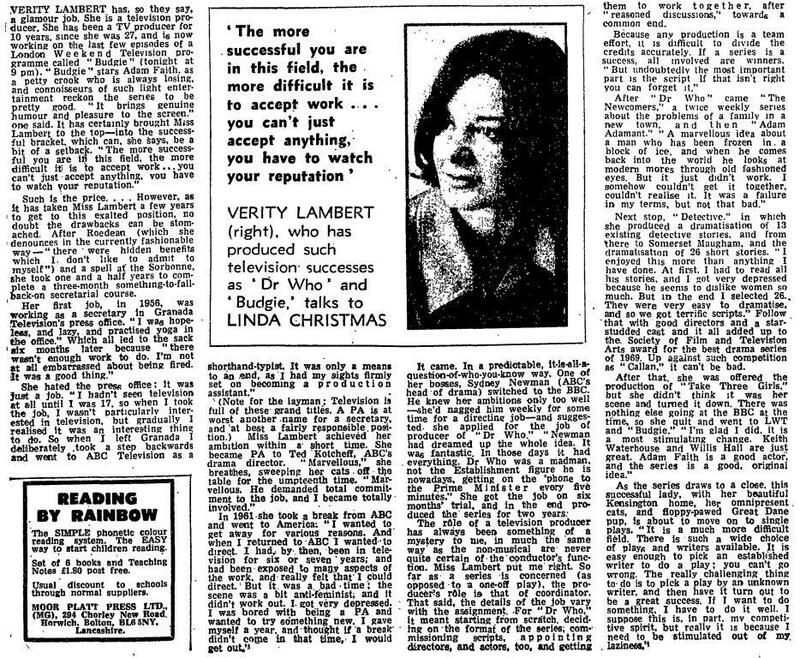 "Verity Lambert, who has produced such television successes as 'Dr Who' and 'Budgie,' talks to Linda Christmas." The Guardian [add city] 1972-06-23, 11. Print. Turabian: Christmas, Linda. "Verity Lambert, who has produced such television successes as 'Dr Who' and 'Budgie,' talks to Linda Christmas." The Guardian, 1972-06-23, section, 11 edition. This page was last modified on 17 November 2014, at 23:43.